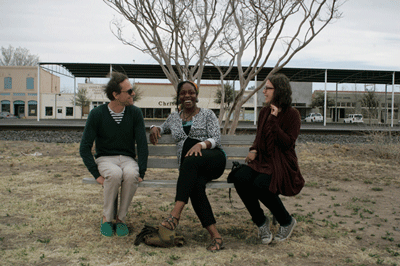 What happens at Fieldwork: Marfa? "Emerging artists are encouraged with programs such as Fieldwork Marfa, the brainchild of two major European art schools, ESBA Nantes Métropole and HEAD Geneva. The international research-in residence program is dedicated to the practice of art in public space, critical approaches to landscape and artist projects intended for emerging artists, curators and researchers; six lucky artists are selected a year." 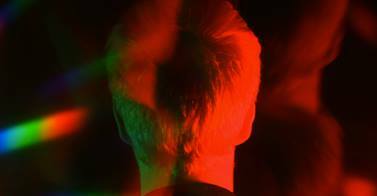 PRESS / A review of Martha Kirszenbaum's screenings at Fieldwork: Marfa in Glasstire. by Nicholas Knight. RESIDENTS / We are very pleased to welcome our two new residents: artist Etienne Chambaud and curator and writer Vincent Normand. Etienne Chambaud and Vincent Normand are in Marfa to work on their current research project: La Nuit Sauve. La Nuit Sauve intends to travel across the symbolic stratification of sites of knowledge or landscapes that have shaped the modern gaze projected on Nature, in which they have crafted physical or symbolical borders: a natural history museum, a biosphere reserve, a zoo and a desert. It will be composed of both a feature film and a book. Our curator in residence, Elise Lammer started writing for 60 pages. You can now follow her West Texas adventures. First post on roadkill cuisine: Streetmeat and Highway Pizza! Our two artists in residence, Pauline Beaudemont and Elise Lammer welcome curator and writer Martha Kirszenbaum for a special film screening at the Fieldwork: Marfa gallery space. 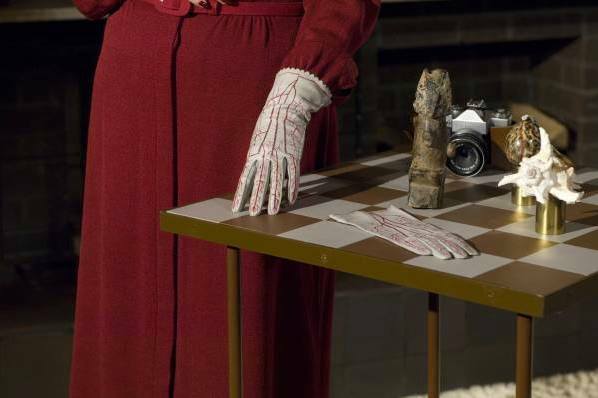 "Fetish and Figure" brings together six films and videos by artists and filmmakers that address both the fetishisation of objects and the exclusive relation between the representation of objects and the body. Exploring the theme of "tableau vivant", this program challenges the presence of the human body that disintegrates, allowing objects to come to life on screen as the camera captures them. The proposed works share a common approach of feminine iconography constructed around sophisticated accessories - perfume bottles, enchanting jewelery and shimmering pieces of clothing - while questioning images of voluptuousness and consumption and, finally, reflecting on human solitude, existential melancholy and physical disappearance. Martha Kirszenbaum is a curator and writer based in Los Angeles and Paris. She serves as the director and curator of Fahrenheit in Los Angeles and is the 2014 associate curator of La Kunsthalle Mulhouse, France. NEW RESIDENTS / Tomorrow we welcome our two first 2014 residents, Pauline Beaudemont and Elise Lammer. Reflecting their common interest in concepts such as non-site, spirituality, dreams and mystic phenomena, Pauline and Elise aim at drawing a cartography of Marfa's subconscious. 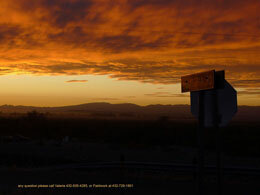 Their idea is to conduct a field research both into Marfa's inhabitants' minds and Marfa's landscape. They will approach the town's onirism in a pseudoscientific and systematic way. This project follows up Elise's long term interest in animism and subliminal episodes, and Pauline's recent Master Thesis project, for which she explored the representation of dreams in visual arts. Please join us this Wednesday February 19th at the Fieldwork: Marfa gallery for a screening of artists Fabien Giraud and Raphaël Siboni new series of films. 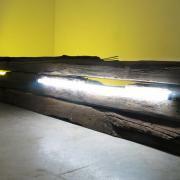 Fabien Giraud is a former resident of Fieldwork: Marfa and will be present to introduce this new body of works. "Good Bye, I Love You"
Emilie Ding discusses her painting and sculpting residence at Fieldwork Marfa. 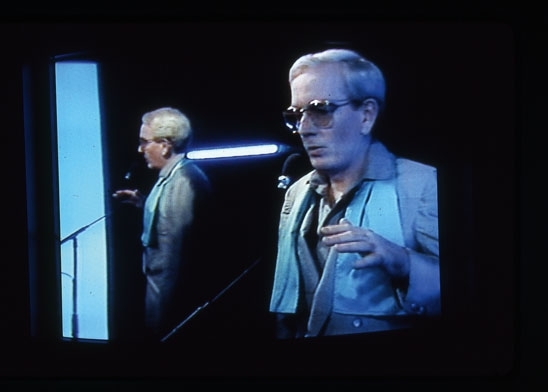 Fieldwork artists in residence Ceel and Vianney invite you to a screening of the Opera Perfect Lives by Robert Ashley (1983, 173min). Join us this Thursday November 21st at 8PM at the Fieldwork gallery on 212 E San Antonio St.
New Fieldwork: Marfa residents Ceel Mogami de Haas and Vianney Fivel invite you to a screening of Ed Atkins' "Death Mask 2 : The Scent" (2010 , 8min) and "Death Mask 3" (2011, 35min). The projection will be at the Fieldwork gallery, 212 E San Antonio St, TONIGHT, Tuesday November 12th at approximately 8.00PM. 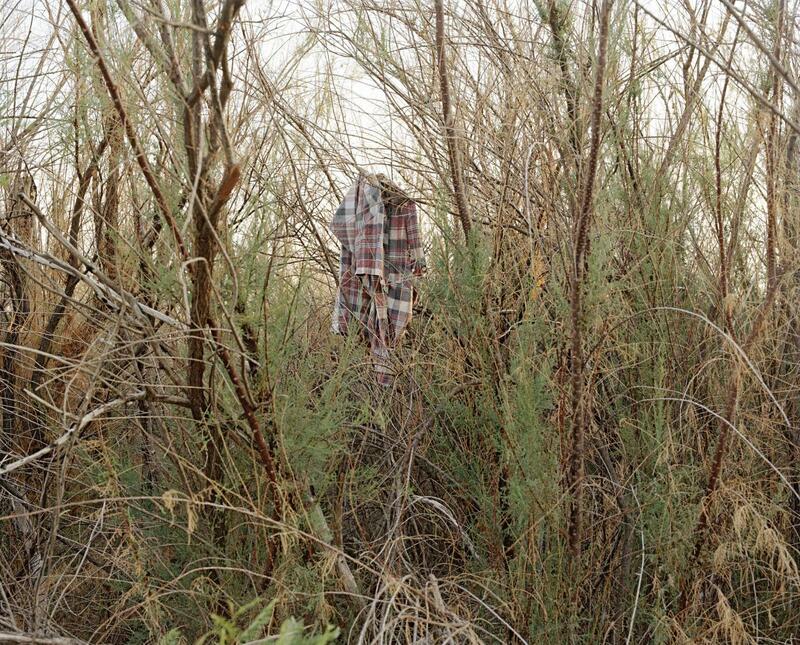 New Talk at Ten on Marfa Public Radio: Fieldwork Marfa research directors, Yann Chateigné and Ida Soulard, join us with the artist, Elisa Larvego, to discuss the Fieldwork Symposium: “Borders Studies and The Limits of Things,” as well as Larvego’s work in the region. The jury was composed by Jean-Pierre Greff (Director, HEAD – Genève CH), Yann Chateigné (Dean of the Visual Arts department, research co-director of Fieldwork: Marfa, HEAD – Genève CH), Ida Soulard (art historian and research co-director of Fieldwork: Marfa, beaux-arts Nantes), Etienne Bernard (curator and director, Contemporary art center Passerelle, Brest FR), Julien Fronsacq (curator, Palais de Tokyo, Paris), Emmanuelle Chérel (art historian and teacher, les beaux-arts de Nantes FR). The exhibition focuses on the way the border leaves its mark on the daily life of Candelaria's inhabitants and on their environment. 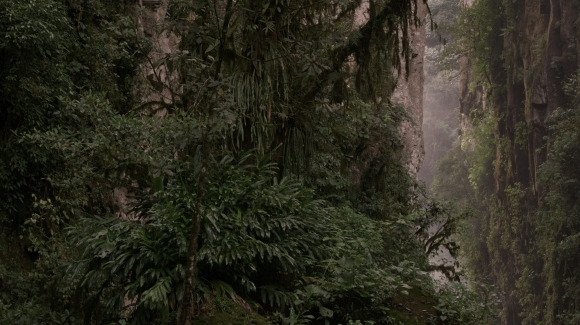 With still photographs, videos and texts, it shows how this geographical line is separating the families and how it generates environemental issues. 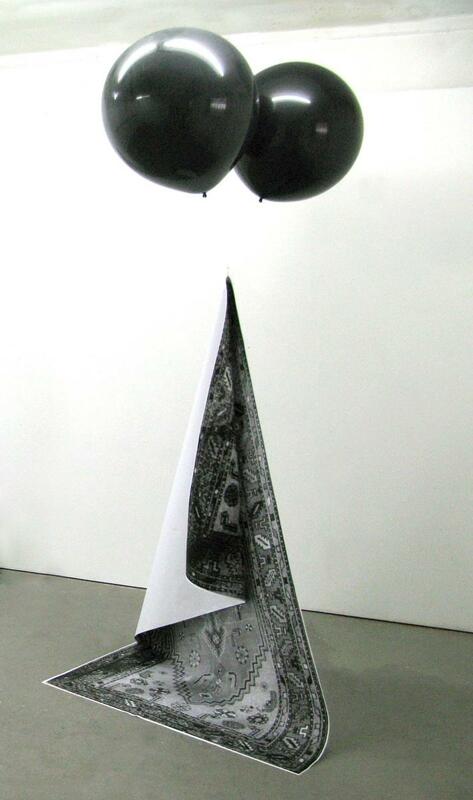 Emilie Ding (1981) is a swiss artist based in Berlin. She graduated from the Head, Geneva in 2008. She was recently included in Hotel Abisso at Centre d’art contemporain, Geneva, La Jeunesse est un Art at Kunsthaus Aarau, Displaced Fractures at the Migros Museum für Gegenwartkunst, Zürich, All of Above at Palais de Tokyo, Paris, Abstraction/ Extension, at Fondation Salomon, Alex. Solo exhibitions include Kunstraum Riehen (2011), Palais de l’Athénée, Geneva (2010), Forde, Geneva (2008). 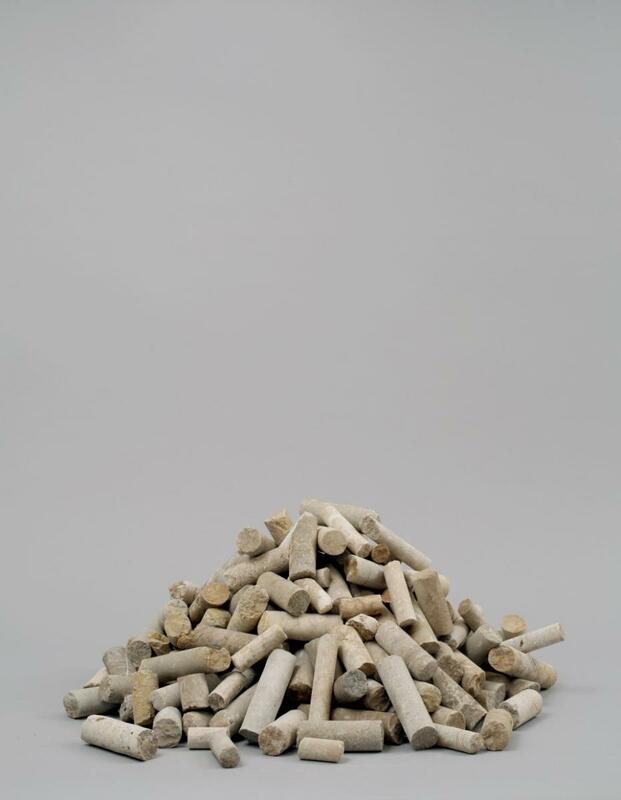 She recently won the Liechti Foundation Prize given by Centre d’art Contemporain Fri-Art. Fieldwork: Marfa is pleased to welcome the new artists in residence, Camel Collective, with the artists Carla Herrera-Prats (MX/US) and Anthony Graves (US). Camel Collective is the name under which Anthony Graves and Carla Herrera-Prats have worked since 2005. Through exhibitions and performances such as “The Second World Congress of Free Artists” at Casa del Lago, Mexico City (2013) “Howls for Bologna” at Overgaden Institut for Samtidskunst (2010), “A Facility Based on Change” at the Massachusetts Museum of Contemporary Art (2011), and “Una Obra Para Dos Pinturas” at the Trienal Poli/Gráfica de San Juan (2012), the group’s interest have centered on the problematics of labor, education, theater, and collectivity. Notes is a film loosely based on the novel with the same name by Eleanor Coppola. She toke notes along the recording of her husbands film Apocalypse Now from 1979, a film based on Joseph Conrad’s novel Heart of Darkness from 1899. Eleanor Coppola observes the huge colonial impact the recording of Apocalypse now have on the Filipino Island where the film is recorded. In my film, Eleanor Coppola’s voice and person is a protagonist who is making a film in Marfa, an artistic and economic colony in the middle of a troubled border zone between Mexico and USA. 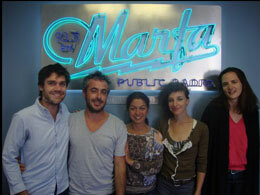 Notes is recorded in Marfa, Texas during a artist-residency at Fieldwork Marfa April 2013. Fieldwork: Marfa Gallery will be closed from July 29 to August 15. Thanks to the 220 applicants from 36 differents countries! The call for application 2014 is now closed since the 1st July 2013. The thematic focus for 2014 is: "borders". On 6 candidates chosen, 3 are alumni from HEAD Genève and/or les Beaux-Arts de Nantes. Residents are selected on the basis of a research project in direct relation­ship with the context, through all its material, historical as well as political dimensions. 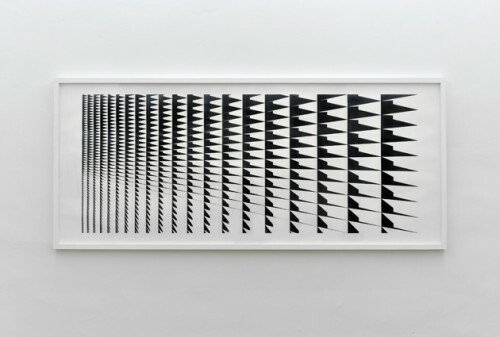 The Marfa Stratum: How much of us is repetition? 2) a book unfolding the complex dynamics which have come to constitute this particular “human event stratum”. 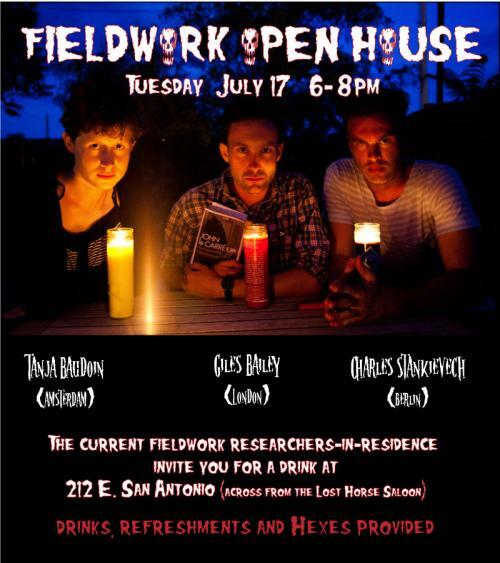 This talk will present the state of our research at the term of our two months residency at Fieldwork Marfa. It will speculate on an ever repeating Marfa: our present stuck in an infinite geological loop where Marfa rises and vanishes in an everlasting oscillation over millions of years. The conference will address the possibility of creating a map of this situation and ways to navigate through it. Entrada was the term coined by spanish conquistadors of the 16th century and described by Charles Nicholl as a journey where “you left the margins, the settled, the known and made your entrance into that unmapped interior where just about anything was possible”. In Marfa, the axiomatic monsters of the cartographies of Conquistadors are here replaced by neoliberal chimeras wandering in the immaculate oil innervated white cubes of art institutions. From the deflagration of cocaine infused dopamine in the brain of international curators to the cognitive erosion of the ecological crisis, our book will be both a grotesquely realist epic of neoliberal art and a practical manual to build escape vessels out of its stasis. describe their latest sculpture and book project, Marfa Stratum. 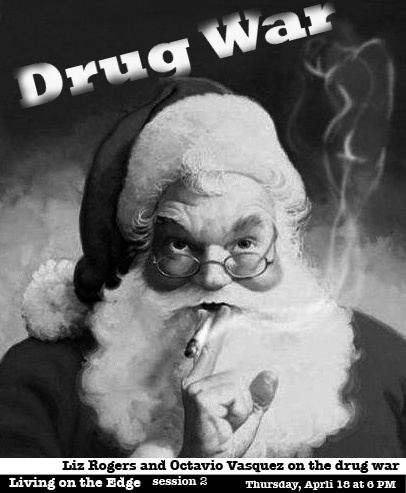 Tomorrow the next step of the Living on the Edge series., this time with focus on the Drug War. “Americans are crazy about drugs” says federal public defender Liz Rogers from Alpine, Texas. She and her colleague, investigator Octavio Vasquez are probably the ones that knows most about this having to defend immigrants and “mules” – people carrying marijuana across the Mexican American border. Joachim Hamou, Fieldwork: Marfa artist in residency is pleased to present you at Marfa Book Company the first session of Living the Edge Talks, presentations on surveying, border control and critical geography April, 11, from 6pm. Enrique Madrid is a historian and activist living in Redford on the Mexican American border. 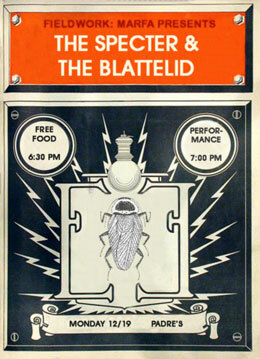 On Thursday he will be presenting his concept of the United States of North America at Marfa Book Company starting 6 PM. His vision is to dismantling the borders of the whole North American continent. "The abyss between USA and Mexico is already filled by millions of inhabitants and this is the fastest growing region in North America. Now there are 20 million people living here but in 20 years there will be 50 millions. And no border patrol will be able to stop all those people crossing the border"
Big Bend is the name of the region in South Texas following the shape of the border with Mexico. On the Mexican side there is an equal bend just west of the first mentioned. Enrique points out that this is a region that is geographically, culturally and symbolically intertwined and he propose the region should be renamed The Great Big Bend. 177 candidates from 36 countries from all over the world had applied to the call for applications last spring 2012. The jury was composed by Yann Chateigné (Head of the Visual Arts department, Head Genève CH), Etienne Bernard (curator and teacher, les beaux-arts de Nantes FR), Emmanuelle Chérel (art historian and teacher, les beaux-arts de Nantes FR), Kathy Alliou (French Ministry of Culture), Sophie Legrandjacques (head of the Grand Café, contemporary art center in Saint-Nazaire FR). 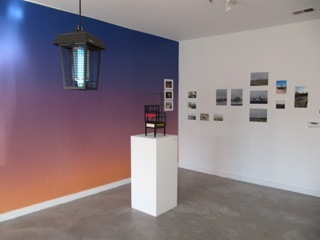 The electromagnetic installation HOMELAND SECURITY (It's hard to find a good lamp) is the latest fieldwork and publication by artist Charles Stankievech. The project emerges from his time spent as a researcher-in-residence at the Fieldwork: Marfa residency in the southwest border town of Marfa, Texas—a site famous for two reasons. On the one hand, Marfa was the home of Minimal artist Donald Judd and his long-term project the Chinati Foundation which houses his 100 aluminum boxes and Dan Flavin's epic six building light situation. On the other hand, Marfa has a 100 year militarized history, from a base established to stop guns being smuggled south during the Mexican Revolution circa 1910 to the current War on Terror and War on Drugs focus on Chihuahua (Mexico's most infamous state for drug cartels and violence) directly south of the town. HOMELAND SECURITY consists of 36 electrifying fluorescent bug zappers suspended in a grid from the ceiling of the town's central public space—an enormous outdoor canopy. 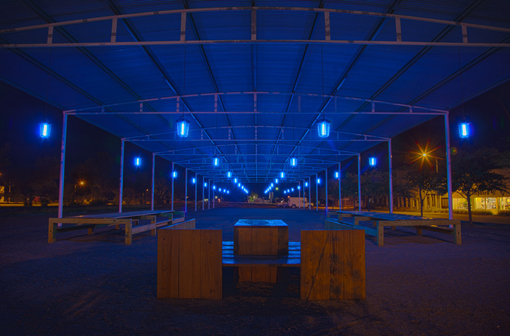 For two weeks (including the open-house weekend of the Chinati Foundation), during the dark hours of the night the lethal devices will fill the site with their blue glow and crackling sounds hinting at the paradoxes of security and beauty. A small book presents the artist's typical associative matrix through his selection of images and texts from the related cultural field, ranging from archival letters to country music lyrics, from historic patents drawings to recent scientific studies. 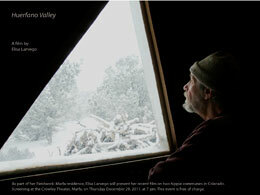 The book is co-published by Marfa Book Co. & Paper Pusher. 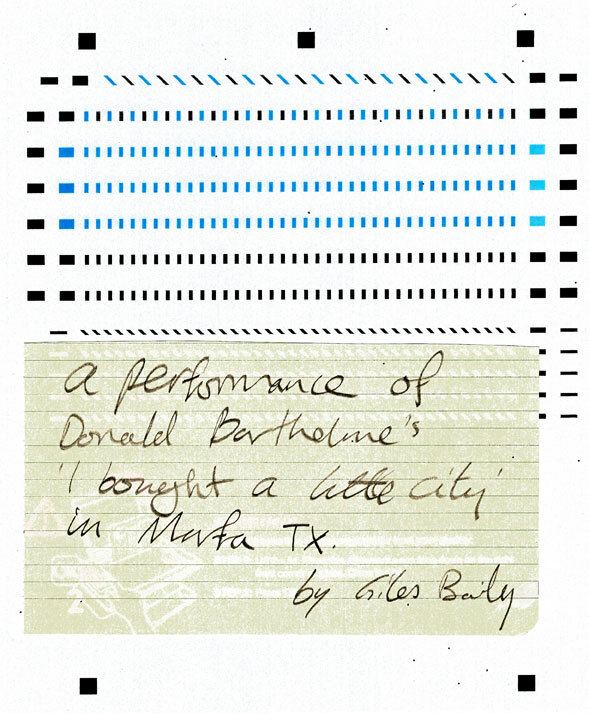 Two performances by GILES BAILEY Fieldwork: Marfa researcher in residence. 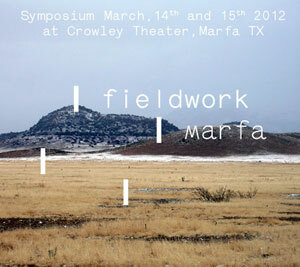 Fieldwork: Marfa is pleased to announce its first annual symposium, which will take place on March 14th and 15th at Crowley Theater in Marfa, TX. and Gerrit Rietveld Academie in Amsterdam. This meeting is conceived as an international research platform dedicated to the practice of art in the public space, critical approaches to landscape/borders and artistic projects based on field investigation methods. 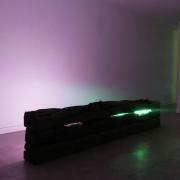 The program is structured around the presentation of specific projects developed on site by six artists in residence. Artists, teachers and writers from each school are invited to present their own research on complementary issues, contextualized there, in dialogue with the residents. A series of interventions by special guests will complete the whole program, which is intended to share these numerous practical and theoretical explorations with the group of students, as well as with and a broader audience. The symposium is accompanied by two public events: on the first evening, the opening of the exhibition which will be held at Fieldwork: Marfa Art Space, presenting the projects of the first six artists in residence; on the second evening there will be a screening of the US premiere of the audiovisual show "The Mirage of History", preceded by talk with artist Rosa Barba (IT). In 1981, artist and writer Donald Judd signed his name to a German phrase he found on the wall of one of two artillery sheds at Fort D.A. Russell, Marfa, Texas. 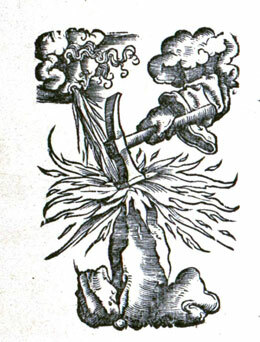 The phrase, translated in English, reads, "It is better to use your head than to lose it." In the two sheds, Judd would install the post-contemporary memory theatre, otherwise known amongst the cognoscenti as 100 Works In Mill Aluminum. On Tuesday February 7 and Wednesday February 15th, Talk at Ten on Marfa Public Radio (10 AM CST on KRTS 93.5 FM) will broadcast the first segment of a two-part series entitled A Hammer to the Head for Talk at Ten: On a Neuromorphic Architectonics of Narrative. The program will include the broadcast of works by radio philosopher Gregory Whitehead and poet David Antin, with introductions by Emily Verla Bovino, a resident of Fieldwork: Marfa. Segment one will feature Dead Letters, an experimental documentary by Gregory Whitehead produced in 1985. Segment two will feature line, music, counterpoint, disjunction and the measure of mind, a talk by poet David Antin given at the St. Mark's Poetry Project in 1984 . Benoît-Marie Moriceau, FR. Lives and works in Rennes, FR. Charlotte Moth, UK. Lives and works in Paris, FR. Tove Storch, DK. Lives and works in Copenhagen, DK. Wilfrid Almendra, FR. Lives and works in Cholet, FR. Emily Verla Bovino, USA. Lives and works in La Jolla, CA. Elisa Larvego, CH. Lives and works in Geneve, CH. and US premiere of Robert Smithson's "Breaking Ground: Brocken Circle/ Spiral Hill" (1971-2011) about his only earthwork still in existence outside the United States. Forty years after the completion of Brocken Circle/Spiral Hill (1971) in Emmen (The Netherlands), the film that land artist Robert Smithson had never been able to finish due to his untimely death, has now been completed as a video with support from Dutch partners and SKOR Foundation for Art and Public Domain. They have been selected among 151 applications from more than 30 countries. ESBA Nantes Métropole is supported by the Cultural Services of the French Embassy and the Consulate General of France in Houston, Texas. HEAD–Genève is supported by Fondation Gandur pour l’Art, Geneva. Gerrit Rietveld Academie, Amsterdam is advised and supported bySKOR Foundation, The Netherlands.